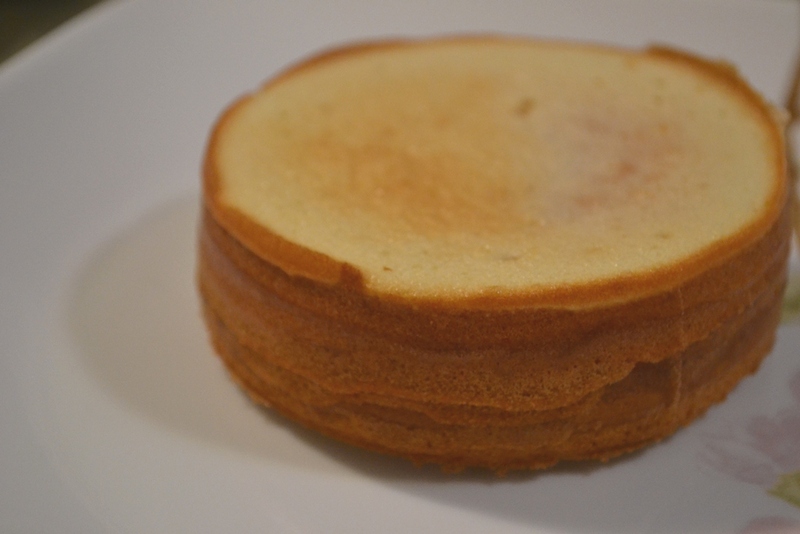 Baumkuchen literally means “tree cake”. Baum is “tree”, Kuchen is “cake”. Of course tree cake is not really a reasonable name unless you make a cake that looks like a tree. If I would have to translate it, I would rather call it a “layer cake”. You’ll understand why after reading the instructions. Typically, I use a bit ground pan called a spring form to make this cake. It will give you one big cake which you can cut in 12 or 16 pieces. 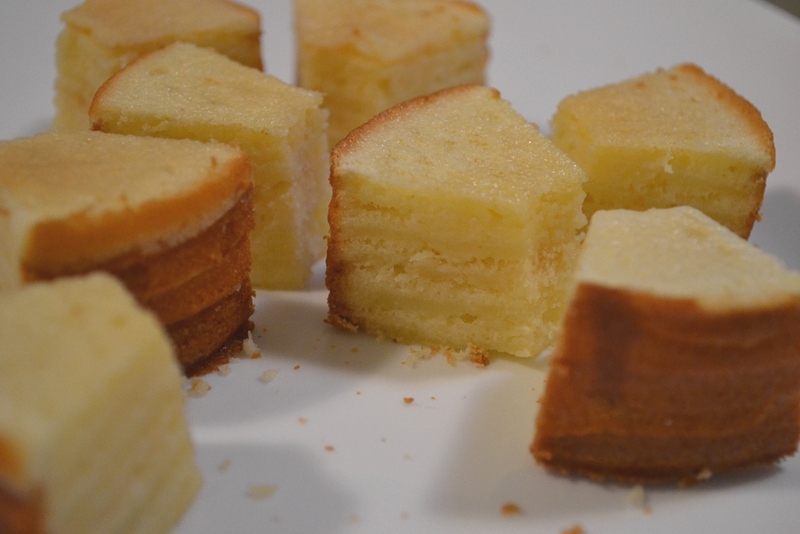 However, this time I used two little spring forms to make several smaller cakes. Combine egg yolk, 150g of sugar, vanilla (sugar), and lemon zest in a bowl. Then beat the butter in a separate bowl until soft and foamy and add the flour and corn starch. Combine both mixes well. Take the egg white and beat them until slightly foamy, then add the sugar and bit until it is stiff. Combine it with the other mix carefully. You should use an convection oven if possible, but a regular oven works as well. If you use a normal oven, make sure you use a higher rack. For bother the convection oven and regular oven you look at a temperature of about 200°C. Remember that temperatures always depend on the type of oven you have. You might need to experiment somewhat. 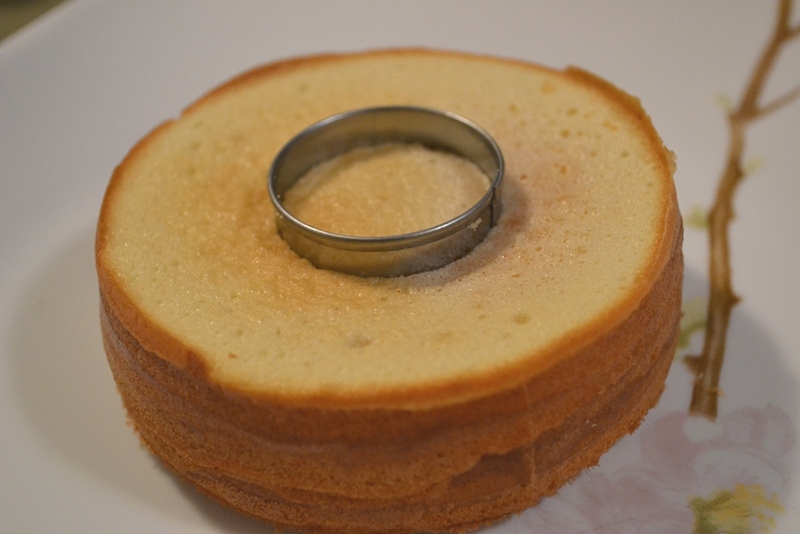 Take the spring form and place parchment paper in the bottom, snapping it in with the ring. Now use a ladle to fill the bottom but do not use too much. You want thin layers. Tap the form before baking int he oven. A precise amount of time is tricky. 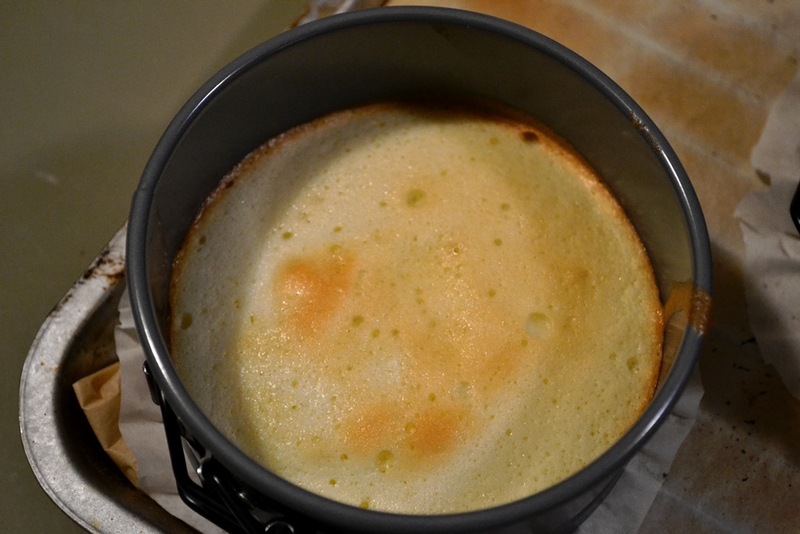 You need to bake the layer until you have a light to middle brown. This might take 2 min or 10, depending on the size of your oven, the spring form and other variables. Repeat this step until the spring form is full. Remove the cake from the spring form and let it cool completely. While you wait you should melt the chocolate. 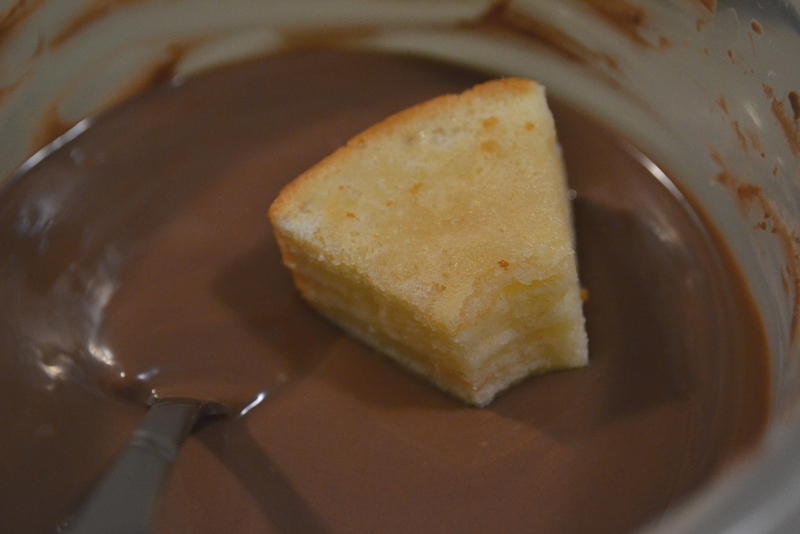 If you used a big form, pour the chocolate over the cake and let it cool down again before cutting into pieces. If you used a small form you might want to make little pieces. Using a round cookie cutter, cut out the center. Then cut the ring into 8 pieces. Before you dip the Baumkuchenspitzen or “Tree Cake Tips” into chocolate you can brush them with rum or another type of liquor. It gives them an extra flavour. Then dip them into chocolate and place them on aluminum foil to cool. You can store them in the fridge for several days but they are fairly moist, they should be eaten quickly. They look so cute and delicious! 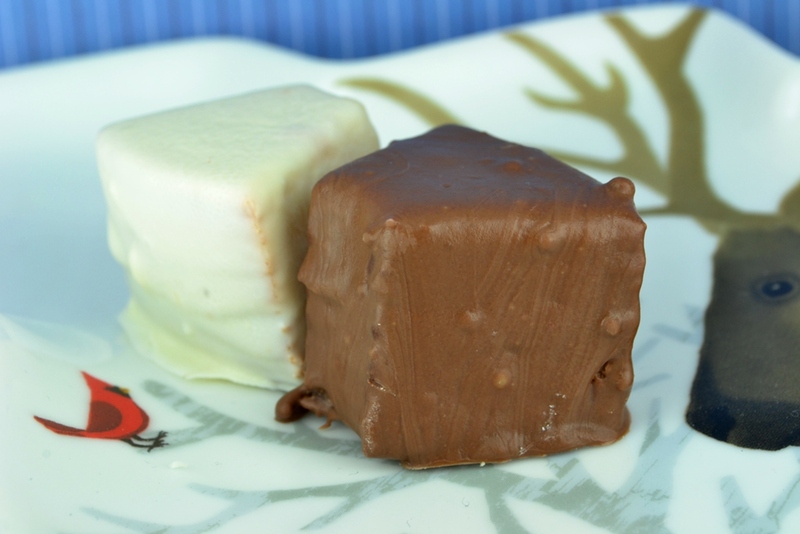 I love the chocolate part too — I can never resist anything with chocolate!